3M: Mud, Microbe, and Molluscs Iris Anderson, Professor of Marine Science at VIMS, speaks to Marine Science Day visitors inside the 3M: Mud, Microbe, and Molluscs room in Chesapeake Bay Hall. © C. Katella. Costume Contest The contestants in the 2018 Marine Science Day costume contest. © C. Katella. Technology in Marine Science David Stanhope of CCRM demonstrates a heat-sensitive camera at the biodegradable plastics station. © C. Katella. Cooking Demonstration Chef Wade O'Neill, Culinary Arts Faculty at Hampton City Schools, speaks to a packed house at the Seafood Cooking Demonstration. © C. Katella. Nunnally Ichthyology Collection Diego Vaz, a graduate student at VIMS, describes the various means samples are prepared of Nunnally Ichthyology Collection specimens. © C. Katella. Algae Cultivation Amanda Chesler-Poole, Hatchery Specialist with the ABC program at VIMS, describes the process through which algae is cultivated at the Oyster Hatchery. © C. Katella. Shoreline Studies Bruce Pfirrmann, graduate student at VIMS, describes VIMS' shoreline studies work in front of the York River pier. © C. Katella. VIMS' annual open house is a fun-filled event for the whole family. Join us in Gloucester Point for exhibits, children's activities, seining in the York River, lab tours, a seafood cooking demonstration, mini-lectures, and much more. All activities are free, as is parking. The event takes place rain or shine. 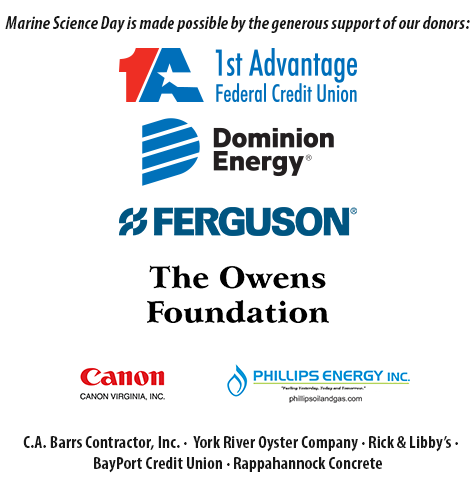 Marine Science Day 2019 will take place on Saturday, May 18th. The first 100 attendees to register online will receive a VIMS-branded reusable shopping bag when they check-in at Marine Science Day. Pre-registration allows you to skip the lines and check-in at the Welcome Booth using the Fast Lane. Create a marine-themed costume to participate in our Marine Science Day Costume Contest. Everyone, every age, can participate by creating original costumes of marine plants or animals. Individuals and groups are welcome. Ribbons are awarded for most original plant or animal, most creative use of materials, best group costume, and best representation of a plant or animal. The overall winner will earn a $50 gift certificate to VIMS' Gift Shop. Enter today: MSD Costume Contest Registration. Visit our Flickr and YouTube pages to view wonderful costumes created and worn by individuals and groups in past years. Design the artwork for Marine Science Day 2019! Winning artwork will be used on the Marine Science Day T-shirt and in other promotional materials. This year's theme is Search Out - artwork should depict the ways VIMS scientists discover new solutions to help marine life and our marine environment. The deadline for the Artwork Contest was March 4th, 2019. Ocean research takes VIMS scientists from Poquoson to the Poles. Learn about efforts by VIMS researchers in the Chesapeake Bay to manage blue crabs, restore oysters, survey fish populations, unravel biodiversity, and monitor water quality. Also, learn about our international work in Antarctica and the deep sea. These exhibits are located in Watermen's Hall and Chesapeake Bay Hall and are open continuously from 10 am - 3 pm. Tour working laboratories to learn about the latest tools and techniques of marine research. Scientists lead the tours and will explain their current research. Learn and have fun with crafts and other activities in our Children's Pavilion. Tour our Teaching Marsh, Shellfish Hatchery, and Riparian Forest. Collect, observe, and learn about estuarine organisms from the York River. In addition to our day-long activities, we offer a series of events that begin at specific times. These events include 10-minute Fast Talks, a seafood cooking demonstration, and more. The Program of Events will be available online closer to the date of the event. Marine Science Day T-shirts and other clothing and memorabilia will be for sale in the VIMS Gift Shop. Hot sandwiches, snacks, and drinks will be available for purchase near the Children's Pavilion, and sno-balls will be available for purchase in the boat basin.